Hey all, i recently finished on the framework for a platformer game. I really have not figured out a name for it yet, so ill have to think of it as a add more to it. Its still very simple, just the framework as mentioned before. I used the placement editor to design my levels, so the hard part was working out a stable gravity simulation with physics. There are three stages, each with different scrolling methods. Stage 1 enables scrolling only on the x-axis, stage 2 only on the y -axis and stage 3 is both. I have to warn you though, i have not perfected scrolling on stage 3 so if you fall off just close the game. Besides that there are only really 2 other small glitches, but you'll have to find those for you're self. BTW: I finally purchased AppGameKit and got it working , so this demo can be played by anyone. The game file can be downloaded from the bottom right forum link. As always im welcome to any ideas and advice, so please fell free to do so if you wish. Remember to have fun! Added the new version to my first post. interesting, well done...first stage reminds me SuperMario. The movement on x-axis is at the moment a little unrealistic, but I think that you will fix that. A question: the empty boxes that sink when the main character moves onto, are physics dynamic sprites with mass=0, so they do not react to gravity force? How is the x-axis scrolling unrealistic? Because it only goes in one direction then locks at the end of the stage? I really don't think it matters anyway, you were right, I polished the x-axis scrolling so that it works in both direction without going past the stage borders. I also fixed up the y-axis scrolling as well as the x and y scrolling together to work better as well. As for you're question, its a bit more complicated than changing the mass on the empty boxes. Since im using the placement editor to assemble the stages , im able to give each a string (name) that helps to distinguish it from all the other entries in the placement editor array . 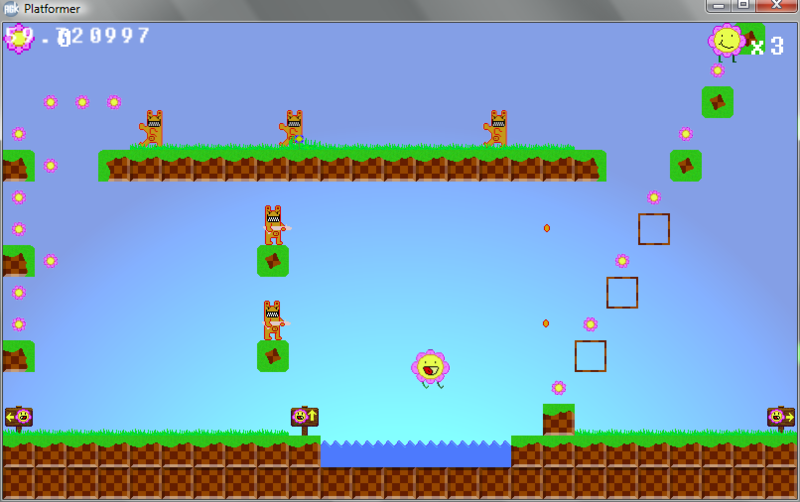 So from there i detect if the small flower (player) sprite had a physics collision with any certain empty box. Then from there i delete the empty boxes physics properties then turn it back on as dynamic to make it fall. Anyway i have a small question for you, or anyone whom replies next. On the second stage, were you able to figure out that you could walk from one side of the screen to the other on the x-axis? Did the arrows help? yes, I observed this wrap-around feature. What is the question? What do you mean "if the arrows help"? Quote: "Anyway i have a small question for you, or anyone whom replies next. On the second stage, were you able to figure out that you could walk from one side of the screen to the other on the x-axis? Did the arrows help?" This wasn't obvious, an arrow would help. Maybe you could put a door where you can go through it and come out of another door higher up? EDIT: Good work BTW, I forgot to say! Ah, now I have understood. I thought of arrow keys. You could use a sign "Thru" like the one used in the old Popeye videogame by Nintendo, see attached screenshot. Thanks, i think i will put up an arrow sign like that in the popeye game. Not really sure if i will use the word "thru " though. Ill figure something out. 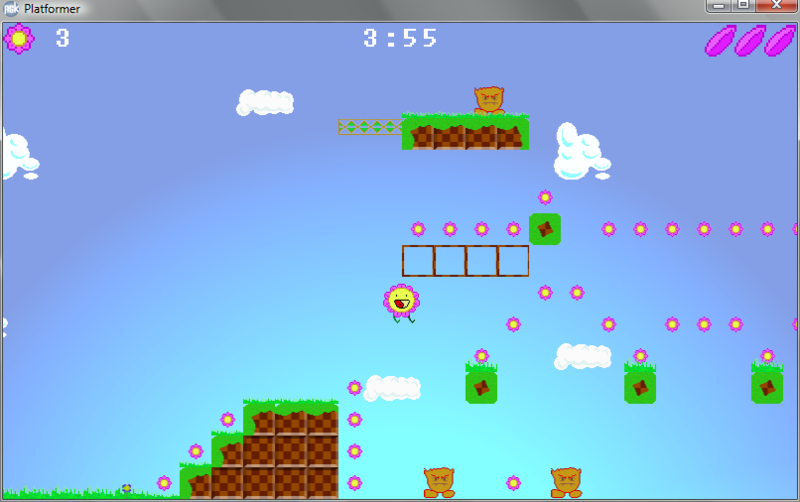 Well here is the latest build of my still UN-named platformer. Although i cant really call it a demo, more of a WIP. I haven't worked on it in while so there is not much added on to it. I mostly focused on game play aspect, rather than menus and etc. About the updated controls, there not show in the game. So walking left and right are done with the left and right arrow keys. Jumping has been moved to the up arrow key, and firing you're weapon is now the space key. The longer you hold the up arrow key the higher you will jump until to reach a set maximum height. The game file can be downloaded from the post on the bottom right. As always im open to ANY suggestions, tips, anything that you think could make this a better game. Downloading now. Looks interesting, and a lot like Eversion. Have you played that? Was it an inspiration? I'll let you know my thoughts when I'm done! I have never seen eversion before, im not surprised someone else has already featured a platformer with a flower like character as the protagonist. I find it extremely hard to be original these days... but this is my first platformer and its really just about learning more about game design. The theme is great! My girlfriend saw it only for a second and said "Wow that flower has a cute walk!" I reckon you should keep, and expand on it! - I really liked the screen wrap (exit one side, enter on the other). It will make for some interesting puzzles! - The jump could be a bit faster. At the moment it's upward velocity is good, but it kind of "floats" down once it reaches the apex. It's not bad, just makes the game feel a little slow. - I liked the sound effects, and the general ambience. - The shooting was very satisfying, but I couldn't tell what the feathers in the top right corner were for. I knew they related to shooting, but no matter how many I shot, I still had three up there. - How do you make levels? I read through the level files, and they seemed pretty self explanatory. Do you have an editor? Can we make levels? - The flower is cute as Well animated, and the happy face when jumping is really cool. The game feels good, if a little slow. I like where you are going with the happy-land aesthetic, and want to see more of that! Really good start. Looks fairly good. What platforms do you target? Wow, really appreciate the advice! I feels nice to know that my work fits up to others standards. As for the jumping and gravity simulation, after playing through eversion i realized that mine was extremely slow. I manage to speed it up, but there are always small conflicts that arise. I believe I can manage through. About the three leaves in the top right corner of the screen, those are actually health icons. They decrease when you run into an enemy, ending the game when you have none left. I guess that the shared weapon image can be a bit misleading, ill change that. 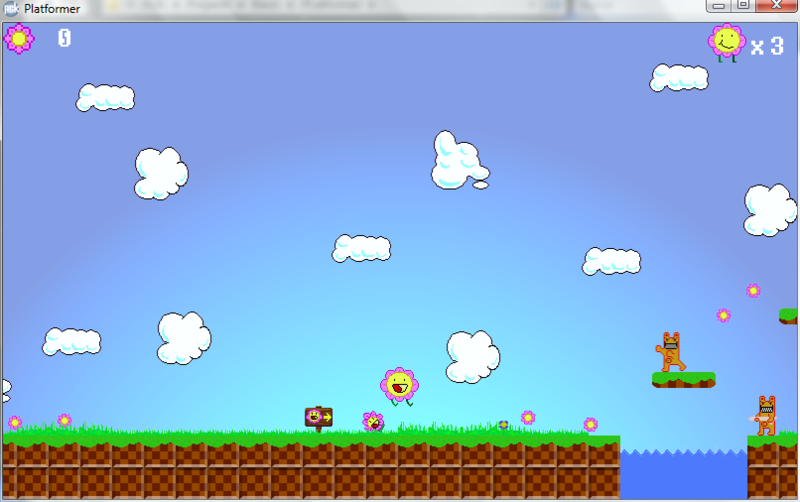 Right now this is more of a learning experience being my first platformer. I literally went one zero previous experience coding these types of game and am very happy with the outcome. All i can really do for now is android and PC, although i cant really test for android seeing as that i don't have any device that runs on it. IM thinking of getting a Nook tablet for college, but it will double as a game tester ;D.
Alright here is another little update, i just work 8 hours today straight on the new stages and some other things. So i hope you all enjoy it. and a ton of fixes. Still only three stages, but there really challenging! Vertical lifts are buggy so i left then out for now. The shooting enemy's are buggy as well, so they shoot randomly instead of at a constant rate. Not sure if they are better that way. Anyway, the goal is to simply reach the end of the stage where you will be transferred to the next, it loops so after the third stage that's about it. Make sure to stay away from the flying fire head and the spike as they will decreased you're health all the way upon impact. Make sure to leave comment's and tips, Im always welcome to criticism in order to improve anything I can. 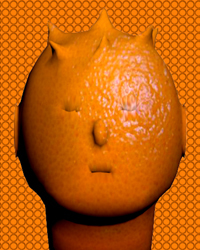 Download it on the bottom right of my post. Here is a quick fix i worked on today, cleaned up the shooting enemy's so that they work perfectly and some crashing error due to array issue.Also I forgot to take out the screen FPS in the top right of the screen so just never-mind it. Download on the bottom right. I think this is a really great start on a Platformer! The flower character is awesome, and I love the idea of losing pedals for health! It does seem a little difficult though to get past the bullets. I think they are shooting just a tad too fast. Gotta watch that fine line between difficulty and frustration lol. I hope you complete this idea, because it's a really great idea!